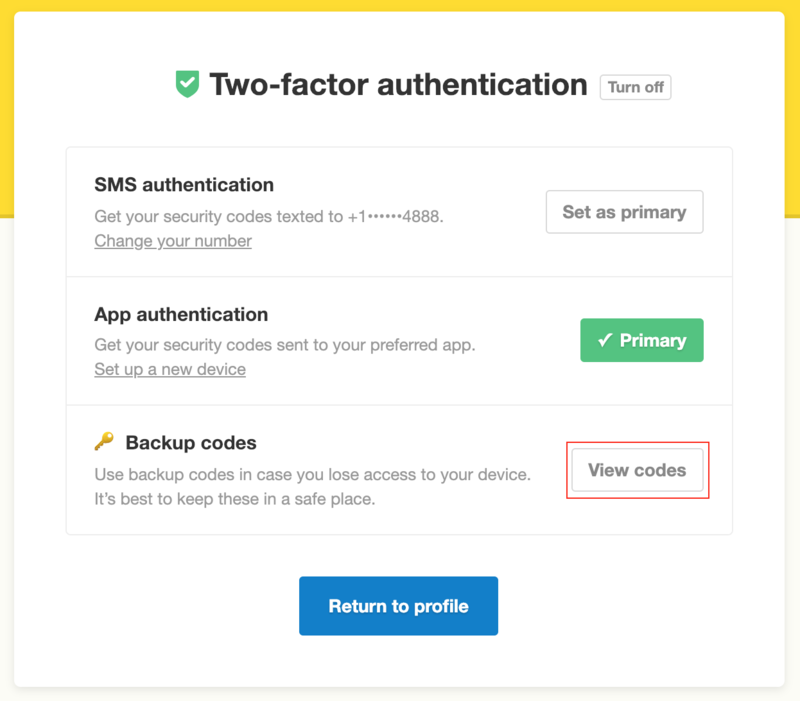 Two-factor authentication (2FA) adds an additional step to logging in for increased security. You can use either SMS text messages to your phone number or an authentication app we support, to retrieve a code you will need for logging in to your Postmark account. 2FA can be enabled by all user types and is recommended for security. Verifying a phone number is a required part of the setup process to ensure you have a backup method of getting logged in if you lose access to a device using app authentication. While logged into your Postmark account, select your name in the top right then choose Profile to access your user settings. Scroll down to the Security area and select Turn on next to Two-factor authentication. Enter in your phone number and click Send code to receive a code. Enter in that code and click Verify code. 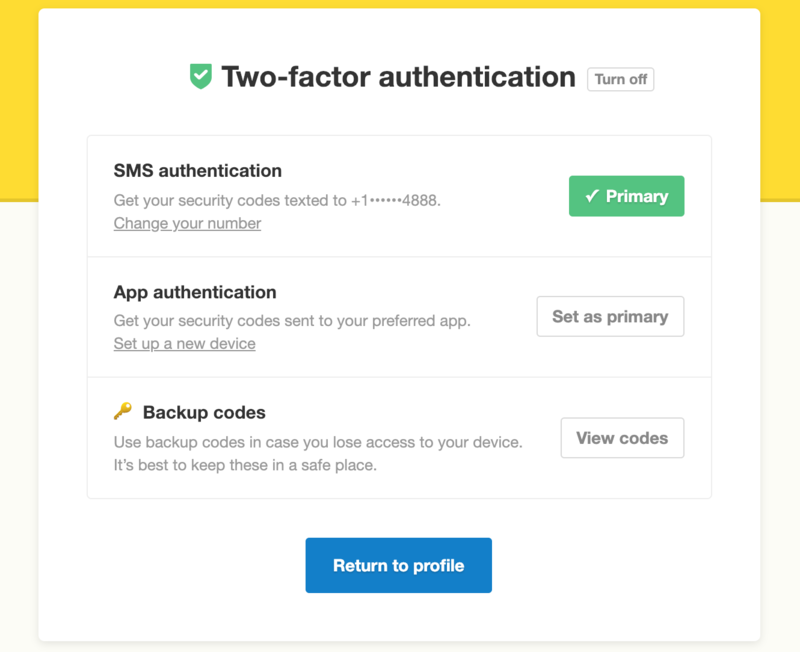 Once your phone number is confirmed, you can set up App authentication, if you prefer to use an app for 2FA. After the setup process is complete, you will see a confirmation page that includes your backup codes. It is very important to save these backup codes in case you need them in the future to log into your account. Scroll down to the Security area and select Manage next to Two-factor authentication. 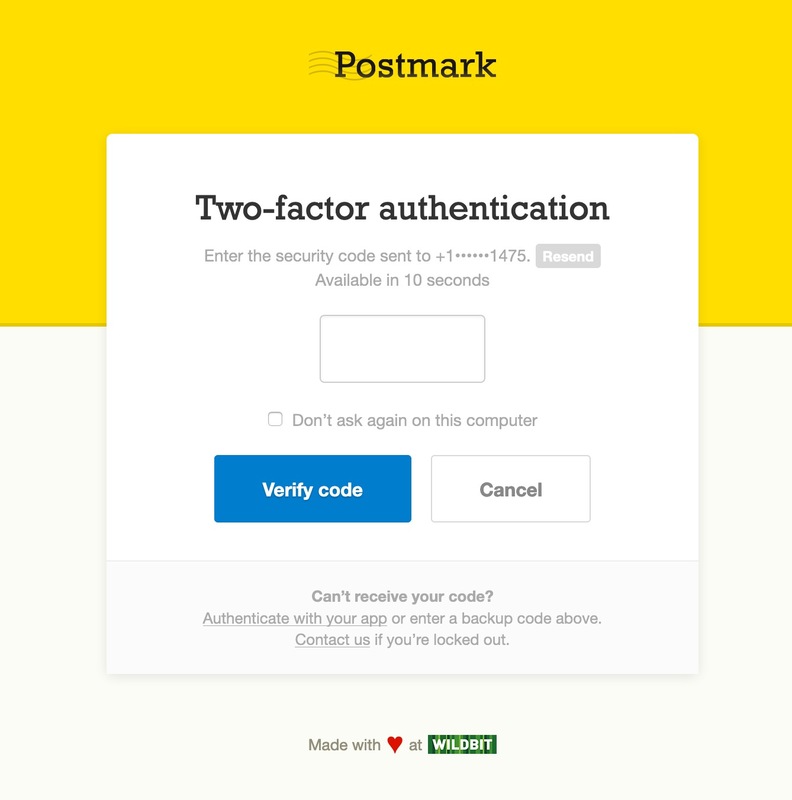 Postmark supports Google Authenticator, Authy and 1Password. Once 2FA has been enabled, the next time you log in you will need to enter in a code after using your username and password to log in. If you did not save your backup codes when completing the 2FA setup, you can still retrieve them. Your backup codes will then be available to download or print. If you are the account owner, you can see who has 2FA enabled while viewing Users. You can use this area to quickly see who has enabled or disabled 2FA for enforcing an account wide 2FA policy. We don't provide an option for using a backup number with SMS authentication. This means that if you change your phone number, you will need to use a backup code to get logged in and change your 2FA phone number. If you are traveling and unable to receive SMS messages, use a backup code to get logged in. If you are using app authentication and have a new phone without the app installed, you will need to use a backup code or an SMS text to get logged in. In the event you cannot use the authentication method you enabled for 2FA to get access to your account, you will need to use a backup code or the backup method of SMS. This is why it is very important that you save your backup codes for situations where you need them to get access to your account. Contact support@postmarkapp.com if you do not have a backup code and cannot complete the 2FA step using SMS or an authentication app.